Angelas Business was written by Henry Sydnor Harrison. 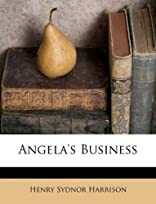 Angelas Business was published by McClellan & Stewart. About Henry Sydnor Harrison (Author) : Henry Sydnor Harrison is a published author. Some of the published credits of Henry Sydnor Harrison include V. V.'s Eyes, Angela's Business. About Frederic R. Gruger (Illustrator) : Frederic R. Gruger is a published illustrator. Published credits of Frederic R. Gruger include Stover At Yale (1912), Angela's Business.